The products offered through Myth Racing Components are designed to assist in the assembly of the early Chrysler hemi. 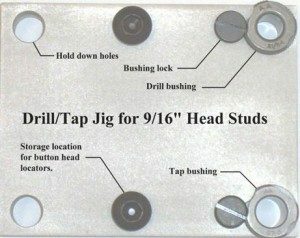 For example, the Drill/Tap Jig shown below is for modifying your block to accept 9/16” head studs. In addition to the bushings and locators shown in the picture, a drill, (3) taps, hold down bolts/washers, tapping fluid and a storage case are included. See the “Products” section for prices, additional information and other usefull tools. Check out the “About Me” to get a feel for who you’re dealing with, the “Tech Talk” section for everything you wanted to know about building and racing an early hemi and the “Products” section for usefull tools that can save you time and mistakes. The race “Results” drop-down also contains tuning information to help with your setup.